In a $670 billion wholesale food industry cycle that serves some 312 million people across the nation, commercial food retailers are generally at the mercy of large food distributors like Sysco and U.S. Foods. Those are the behemoth companies that have access to all the food suppliers – from farm produce to factory-farmed meat – and maintain their inventories with a distinct lack of vendor and pricing transparency for buying customers. Enter Foodem, a start-up online trading, business intelligence and process automator that connects wholesale food buyers (restaurants, hospitals, prisons, universities, governmental institutions) with a range of food suppliers, in a platform that allows free comparison shopping, automated analytics (keeps track of trends and price fluctuations) and a vast array of new food sources to expand buyers’ free market choices. According to Foodem’s founder and CEO Kash Rehman, the setup saves buyers time (an average of three hours a week), and allows them to search for up to 50 items at one time, at pricing that suits their budget since all vendor prices are listed online for the buyer to compare. Sellers grow their businesses by connecting to new buyers in the area, keeping deliveries up to 15 percent more efficient as they find new buyers close to delivery routes. And the end customer benefits by obtaining fresher, more locally sourced foods, leading to a more sustainable food cycle. 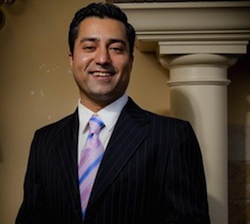 Pakistan-born Rehman attended the University of Maryland as a business major and worked initially as a telecom consultant. Then the economic bust came and Rehman started looking into different supply chains for businesses. After a stint working with a small food distribution company, he learned the process inside out, including the inherent flaws in the system. Foodem Master List. Image Credit: Foodem. Foodem acts as the conduit for all those food suppliers and distributors to find their wholesale customers, for a mere two percent service fee, and guarantees timely delivery of their products. But Rehman came up with another idea to keep his customers’ cash flow running smoothly. Rehman has tech staff working constantly on coding and algorithms to keep all information up to the minute, while providing information on promotions and analysis of changing commodity prices. There is a full time social media manager whose six-days-a-week blog goes far to spreading the Foodem word (“If you Google ‘food distribution,’ Foodem.com comes up on the first page,” Rehman said proudly). Plus he maintains a “feet on the ground” sales team and spends a lot of time at industry marketing events and shows. Currently, Foodem serves the metro Washington, D.C. area, but Rehman wants to move into New York by next year. He has also been fielding inquiries from Canada and Israel. Rehman sees Foodem as giving small businesses their chance for a share of the market they deserve. Kash Rehman, CEO of Foodem. Photo Credit: Foodem. 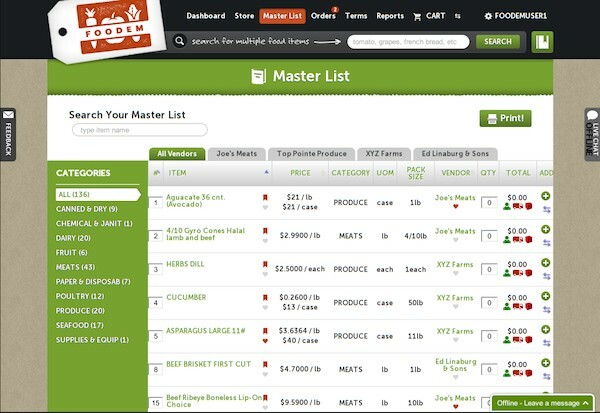 Foodem lists suppliers for everything a restaurant needs from apples to paper napkins. He has small suppliers, who might only offer baby bok choy, and providers that supply tens of thousands of retail chain restaurants. J.R. Paterakis is the vice president of marketing and sales and co-principal of H & S Bakery, Inc, a 70-year-old family baking business outside of Baltimore that operates throughout the Midwest and the Eastern seaboard. They supply baked goods for about 60 percent of the McDonald’s franchises on the east coast. “It’s a great business model and I think they’ll go far,” Paterakis said.